How to identify variant proteoforms in MS data by searching with the customized Protein database? A proteogenomic data analysis of mass spectrometry data to identify and visualize variant peptides. In this tutorial, we perform proteogenomic database searching using the Mass Spectrometry data. The inputs for performing the proteogenomic database searching are the peaklist MGF files and the FASTA database file. The FASTA database is obtained by running the first workflow “Uniprot_cRAP_SAV_indel_translatedbed.FASTA”. The second workflow focuses on performing database search of the peak list files (MGFs). Import the four MGF MS/MS files and the FASTA sequence file from Zenodo. The search database labelled Uniprot_cRAP_SAV_indel_translatedbed.FASTA is the input database that will be used to match MS/MS to peptide sequences via a sequence database search. For this, the sequence database-searching program called SearchGUI will be used.The generated dataset collection of the three MGF files in the history is used as the MS/MS input. We will walk through a number of these settings in order to utilize SearchGUI on these example MGF files. param-files “Input Peak lists (mgf)”: MGF files dataset collection. The section Search Engine Options contains a selection of sequence database searching programs that are available in SearchGUI. Any combination of these programs can be used for generating PSMs from MS/MS data. For the purpose of this tutorial, X!Tandem we will be used. For selection lists, typing the first few letters in the window will filter the available options. Once the database search is completed, the SearchGUI tool will output a file (called a SearchGUI archive file) that will serve as an input for the next section, PeptideShaker. Note that sequence databases used for proteogenomics are usually much larger than the excerpt used in this tutorial. When using large databases, the peptide identification step can take much more time for computation. In proteogenomics, choosing the optimal database is a crucial step of your workflow. PeptideShaker is a post-processing software tool that processes data from the SearchGUI software tool. It serves to organize the Peptide-Spectral Matches (PSMs) generated from SearchGUI processing and is contained in the SearchGUI archive. It provides an assessment of confidence of the data, inferring proteins identified from the matched peptide sequences and generates outputs that can be visualized by users to interpret results. PeptideShaker has been wrapped in Galaxy to work in combination with SearchGUI outputs. There are a number of choices for different data files that can be generated using PeptideShaker. A compressed file can be made containing all information needed to view them results in the standalone PeptideShaker viewer. 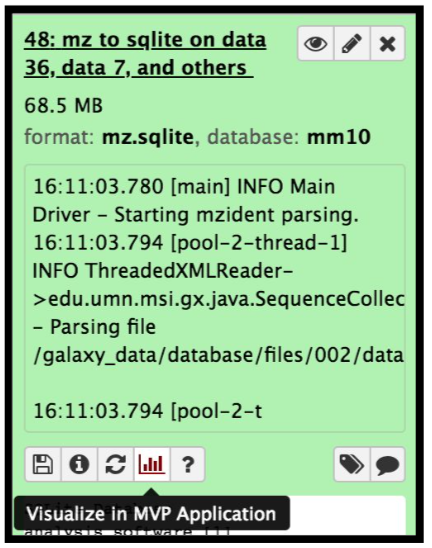 A mzidentML file can be generated that contains all peptide sequence matching information and can be utilized by compatible downstream software. Other outputs are focused on the inferred proteins identified from the PSMs, as well as phosphorylation reports, relevant if a phosphoproteomics experiment has been undertaken. The “Certificate of Analysis” provides details on all the parameters used by both SearchGUI and PeptideShaker in the analysis. This can be downloaded from the Galaxy instance to your local computer in a text file if desired. 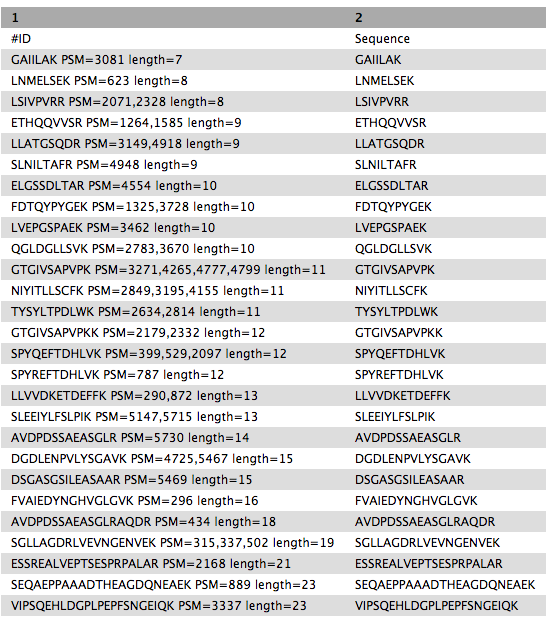 Scrolling at the bottom to the left will show the sequence for the PSM that matched to these peptide entries. Column 3 is the sequence matched for each PSM entry. Every PSM is a new row in the tabular output. A number of new items will appear in your History, each corresponding to the outputs selected in the PeptideShaker parameters. The Peptide Shaker’s PSM report is used as an input for the BlastP analysis. Before performing BlastP analysis. The Query Tabular tool and few test manipulation tools are used to remove spectra that belongs to the reference proteins. The output tabular file “Peptides_for_Blast-P_analysis” will contain only those spectra that did not belong to any known proteins. The next step is to remove known peptides from the list of PSM’s that we acquired from the Peptide Shaker results. For that we need to perform some text manipulation steps to extract list of known peptides from the UniProt and cRAP database. The file named “Trimmed_ref_500_Uniprot_cRAP.fasta” is the trimmed version of Uniprot and cRAP database merged Fasta files. This Fasta file will be subjected to few text manipulation steps in order to get the tabular file for the known peptides. The first step is to convert this FASTA file to tabular in order to proceed with text manipulation. The resultant tabular file will go through a series of text manipulation steps to make it suitable for input to the Query Tabular tool. This step will convert all the white spaces into different tabular column. This step will convert all the dots into different tabular column. Now that we have the list of known peptides, the query tabular tool is used to move these reference pepides from the PSM report. By default, table columns will be named: c1,c2,c3,…,cn (column names for a table must be unique). You can override the default names by entering a comma separated list of names, e.g. ,name1,,,name2 would rename the second and fifth columns. Check your input file to find the settings which best fits your needs. Query Tabular can also use an existing SQLite database. Activating Save the sqlite database in your history will store the generated database in the history, allowing to reuse it directly. Click Execute and inspect the query results file after it turned green. The output from this step is that the resultant peptides would be those which doesn’t belong in the Uniprot or cRAP database. The query tabular tool is used again to create a tabular output containing peptides ready for Blast P analysis. BLAST is a web based tool used to compare biological sequences. BlastP, matches protein sequences against a protein database. More specifically, it looks at the amino acid sequence of proteins and can detect and evaluate the amount of differences between say, an experimentally derived sequence and all known amino acid sequences from a database. It can then find the most similar sequences and allow for identification of known proteins or for identification of potential peptides associated with novel proteoforms. BlastP search is carried out with the PSM report (output from PeptideShaker). Before, BlastP analysis the “Peptides_for_Blast-P_analysis” is first converted from Tabular format to FASTA file format which can be easily read by the BlastP algorithm. This is done with the help of “Tabular to FASTA” conversion tool. The short BlastP uses parameters for short peptide sequences (8-30 aas). Please use the rerun option to look at the parameters used. The output FASTA file is going to be subjected to BLAST-P analysis. This feature provides a means to exclude ID’s from a BLAST database search. The expectation values in the BLAST results are based upon the sequences actually searched, and not on the underlying database. Note this cannot be used when comparing against a FASTA file. Once BlastP search is performed, it provides with a tabular output containing peptides corresponding to novel proteoforms termed as “Novel peptides”. Now this output is further processed by comparing the novel peptide output with the PSM report for selecting only distinct peptides which pass these criteria. This could be achieved by proceeding to the novel peptide analysis tutorial. This material is the result of a collaborative work. Thanks to the Galaxy Training Network and all the contributors ( Subina Mehta, Timothy J. Griffin, Pratik Jagtap, Ray Sajulga, James Johnson, Praveen Kumar)!